The U.S. and Japan won’t enter cost-sharing negotiations until at least late 2019, but it’s never too early to think ahead. The current U.S.-Korea Special Measures Agreement is set to expire at the end of this year, and recent reports have shown that the negotiation process is not only stalled, it may be sliding backward. The problem, it seems, is the Trump administration’s demands for major increases in South Korean compensation for U.S. forces stationing costs. One report even suggests that the White House is seeking 150 percent of the amount from the previous cost-sharing agreement. If these developments have not worried the Japanese government and U.S.-Japan alliance managers, they should. 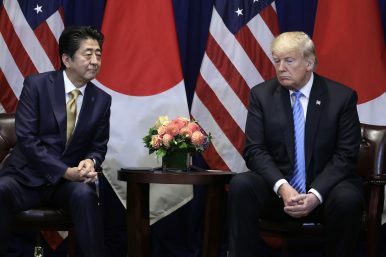 The U.S. and Japanese governments will be entering their own cost-sharing negotiations in late 2019/early 2020, meaning Japan is a near-term target of the Trump administration’s campaign against “free-riding” allies. No doubt, Japan-side negotiators are drafting a list of reasons why they are worthwhile contributors in the relationship, especially in terms of economic benefits to the United States. Still, as the negotiations in Korea have shown, what will ultimately matter to the Trump administration is the final score sheet in the cost-sharing negotiations themselves. With a goal of 150 to 200 percent the agreed amount from the last negotiations, the U.S.-Japan alliance is headed for rough terrain unless the Japanese government and alliance managers on both sides take advantage of three factors that work in their favor. Upcoming cost-sharing negotiations between the United States and Japan will focus on four objects. The first is Labor Cost Sharing, or wage payment for Japanese employees on U.S. installations, currently numbering around 23,000. Second is Utilities Cost Sharing, which covers electricity, gas, sewage, and water for American bases. The third is Training Relocation, or the conduct of U.S. training outside the prefectures in which they are based (for example, F-15s based in Kadena occasionally conduct training from Tsuiki Air Base, a Japan Air Self Defense Force facility in Oita Prefecture). This comes at the request of the Japanese government to reduce operations in certain base-hosting prefectures, such as Okinawa. The final negotiated object is the Facilities Improvement Program (FIP), which covers budgeting for construction or refurbishment projects for U.S. installations in Japan. The first three are formalized in the Special Measures Agreement, and while FIP is separate from that, it is included as a part of cost-sharing negotiations. By design, periodic renegotiation is necessary, which makes sense for several reasons. Economic factors such as currency exchange rates and slow or negative GDP growth can impact an ally’s cost-sharing capacity. There could also be a major change in alliance arrangements whether it is force posture realignment or increases in operational contributions. The current five-year duration of the Special Measures Agreement establishes the requirement for periodic renegotiation to ensure that cost-sharing is still fair enough for both parties according to present conditions. This window for renegotiation, however, has become a target for the ideological shift that accompanied the last change of administration in the United States; so, the table is set for U.S. and Japanese negotiators to tackle the issue of perceived “free-riding” in the alliance. Japan-side negotiators will do their best to argue that Tokyo is far from a free rider. Since the signing of the last Special Measures Agreement in 2016, Japan has continued to grow its defense spending. Notably, the recently published 2019-2023 Mid-Term Defense Program (the Ministry of Defense’s five-year acquisition plan) will push Japanese defense budgets beyond the self-imposed 1 percent of GDP cap that has existed in principle since 1976. The negotiators will also highlight that of Japan’s many programmed acquisitions, most will be U.S. weapons systems like the F-35 (A and B variants) and Aegis Ashore. Finally, Japanese negotiators will be able to highlight implementation of the 2015 U.S.-Japan Guidelines for Defense Cooperation (or “Defense Guidelines”) in being more active contributors to the alliance. This includes its efforts in the “maximum pressure” campaign against North Korea and introduction of new and important mission sets like “asset protection” for U.S. military vessels and aircraft. The problem for the Japanese government is that Korean negotiators could have argued similar changes in their own alliance contributions. Despite inter-Korean dialogues aimed at reducing the South Korea’s principal military threat, its government decided upon an 8.2 percent increase in its defense budget, with about a third of that dedicated to enhancements to defense capabilities. From an economic relationship standpoint, the South Korean government readily renegotiated the Korean-U.S. (KORUS) Free Trade Agreement and ratified it in parliament earlier this month. All this comes at a point when Trump is lauding his own progress in reducing the North Korean threat. Still, with a bar for cost-sharing negotiations set so high and an administration that considers reduction or removal of troops as a best alternative to a negotiated agreement (BATNA), alliance managers have not been able to find ratifiable terms. The U.S.-Korea negotiations will provide lessons learned. Whether U.S. and Korean negotiators can find a ratifiable agreement will be decided well before the U.S. and Japanese governments enter their own cost-sharing negotiations. Though it is unlikely that Korean officials will be offering tips to their Japanese Foreign Ministry counterparts on handling the Trump administration’s demands, U.S.-side alliance managers have the chance to learn from cost-sharing negotiations in Korea. Understanding the major sticking points and potential windows of opportunity within the U.S.-Korea negotiations may offer critical lessons learned for “getting to yes” in the U.S.-Japan talks. Japan has time to prepare for cost-sharing negotiations. Given the way negotiations have gone with Korea, it is evident that the Japanese government will need to increase the amount it spends on cost-sharing. The last Special Measures Agreement in 2016 saw a modest 1 percent increase, but a similar amount in the next round of negotiations will not be ratifiable. Fortunately, the Japanese government has nearly a year to seek ways to show a notable increase in cost-sharing that is not only attractive to U.S.-side negotiators but will be palatable to its own domestic constituency. In other words, this is a crucial period for the Japanese government to craft their own “win-win” negotiating positions. This could be reallocation of programmed “burden reduction” funds to Training Relocation, construction of joint-use facilities (shared by the Self Defense Force and U.S. military), or adjusting cost-sharing schedules to reflect a larger increase in cost-sharing over the course of the five years that does not necessarily impact near-term budgeting priorities. Japan has a potential U.S.-side advocate with a line to the White House. Trump’s well-publicized disagreement with Secretary of Defense Mattis over the value of alliances is leading to the Secretary’s departure at the start of the year. With such a high-level rebuke, it is unlikely that career alliance managers in the U.S. government will have any effect in convincing the White House that its negotiation position in cost-sharing talks is unreasonable or that its BATNA is neither realistic nor in America’s best interests. Nevertheless, Japanese government officials do have a potential advocate in the form of Trump’s hand-picked Ambassador to Japan, William Hagerty. Hagerty was the Transition Director for Trump’s presidential appointments and has remained engaged in the many defense acquisitions that Japan has sought from the United States. With his personal connection to the White House, Hagerty could prove the “fixer” in negotiations that appear destined for discord. The outcomes of the U.S.-Korea cost-sharing negotiations will reveal more about the Trump administration’s position towards the agreement, but lack of progress to date suggests an obstinance that will invariably lead to trouble for the U.S.-Japan alliance if mitigating measures are not taken. With almost a year until formal intergovernmental negotiations begin, there is time to prepare, but adequate groundwork will be necessary to secure a result different from that currently unfolding on the Korean Peninsula. Bickering between Seoul and Tokyo plays directly into the hands of Pyongyang and Beijing.